Mark Hellendrung, CEO of Narragansett Beer, puts in the first batch of hops in Pawtucket, R.I.
Later this month, Narragansett Beer CEO Mark Hellendrung will take a sip from the first beer ’Gansett has brewed in the state of Rhode Island in 34 years. 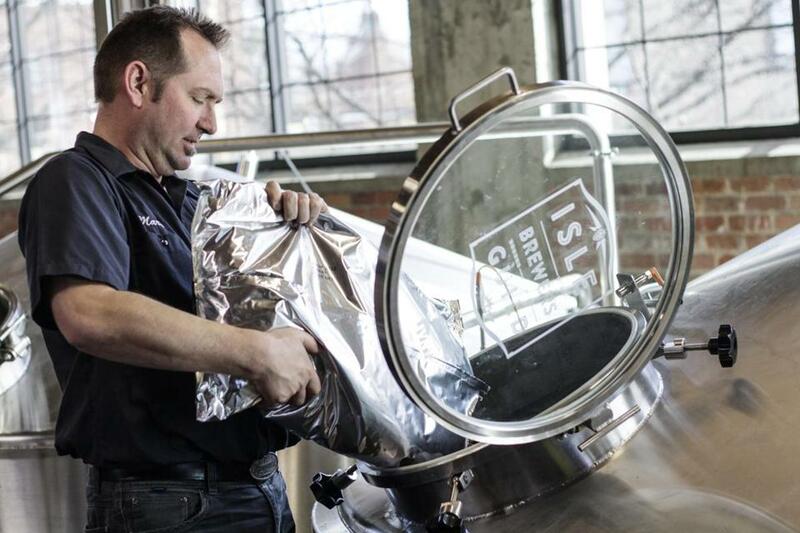 The new Isle Brewers Guild in Pawtucket, a collaboration between Narragansett, Newburyport Brewing Co., and several other brewers and distillers, opens to the public in April. The $15 million project restores 130,000 square feet of old mill space into a brewery and tap room, with a courtyard for festivals and events. The brewers will have access to a massive 100-barrel brewhouse made in Oregon, as well as a canning line slinging 240 cans per minute. It’s equipment that allows partners like Devil’s Purse Brewing Co. and Farmer Willie’s Alcoholic Ginger Beer the opportunity to work on a different scale. And it allows Narragansett, the company associated with Curt Gowdy and “Jaws” and the Impossible Dream Red Sox, a long-sought Rhode Island footprint. Early visitors to IBG will get a preview of what’s to come. A tasting room will be set up in the brewery, to be replaced by a 6,000-square-foot beer hall at a later date. “What a cool thing for a craft beer drinker to go to a brewery and get four or five different brands of fresh, fresh product that’s brewed there,” says Max Easton, cofounder of Farmer Willie’s, which makes an alcoholic ginger beer that can be sipped straight or mixed into cocktails. Devil’s Purse will use the partnership with IBG to up distribution of two of its beers, Handline Kölsch and Surfman’s Check ESB. This will allow the Cape Cod brewery to free up space for more experimental brews at its South Dennis location. The first beer off the line in Pawtucket for public consumption (there have been test batches) will be Narragansett’s It’s About Time IPA, a new year-round release. Narragansett will brew Summertime Citra Ale, as well as its Lovecraft series and seasonals like Fest, in Pawtucket. Narragansett lager will continue to be brewed in Rochester, N.Y.
Isle Brewers Guild is at 461 Main St., Pawtucket, R.I.
Due to incorrect information supplied to the Globe, a previous version of this story misstated Isle Brewers Guild’s opening date. The Pawtucket project will open in April.